First things first. I asked for help in my last post, and Kate, Johanna, and Lisa came through! I picked up a C hook, and put my weary joints to work. It took a few tries, but with a little guidance from the Lion Brand page I got those pesky button bands attached. The next morning, at the Wild & Woolly sale, Alison helped me pick out a pearly pink button. Thanks, girls! Accompanying the pretty pretty pink is the completed Mickey I knit for Jason's brother's baby. While it wasn't technically finished for the shower two weeks ago, I was able to baste in the sleeves before I wrapped it up and gave it to her. Then I did the old "glad you like the present, please give it back to me so I can finish it!" trick, and finished it up last week. 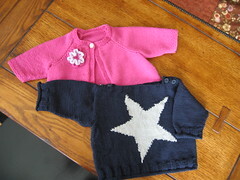 To recap my experience with this sweater, pattern: way cute, intarsia: not for me. Lottie and Mickey, perfect together... hey, maybe their eventual owners will be, too! Aww, they look so sweet together! What great baby knits. Definitely worth a few good boomerangs. Your comments on Mickey mirror mine: Cute pattern, however instarsia is not for me. I wish I could show you my finished Mickey, but I don't have a blog. Anyways, I was glad to find someone out there that was working on the same pattern. I ended up using Cotton Glace in my stash for the sweater which worked out pretty well. Great job! Wow, you are good. The jackets are impressive. Every time I try to start a project like that, I seem to get distracted and never finish.